Should the Carbon Price Floor be scrapped? The Carbon Price Floor (“CPF”) is a UK government mechanism designed to support decarbonisation by making it more expensive to generate electricity with carbon-intensive fuels. The doubling in the CPF in 2015 from £9 / tonne to £18 / tonne means the CPF now represents about 34% of the marginal cost of a coal-fired generator and 15% for a CCGT. The result has been an acceleration of the closure of coal-fired generation (aggravating tight supply margins) and higher wholesale electricity prices, with the UK market typically trading at a premium to the Continent. The question is whether this mechanism does more harm than good. Energy users such as Ineos have consistently lobbied against the tax. Against a backdrop of a government narrative that seeks to “rebalance” the economy away from a reliance on the services sector, artificially boosting electricity prices is unhelpful. Some argue that the EU’s Industrial Emissions Directive (“IED”) will force coal plant to close anyway, so the carbon price floor is un-necessary and by 2025 will be completely redundant. The UK’s carbon price support makes UK wholesale prices relatively expensive, attracting imports into the UK market, and supporting the investment case for more interconnection (which the government is now including in its capacity auctions). A recent report from Aurora Energy Research suggests that this effect results in imported coal-generated electricity displacing domestic generation thereby inhibiting investment in cleaner CCGTs. Removal of the carbon price floor would lead to a renaissance in coal generation up to the 2020 deadline for the IED, but would also stimulate investment in new CCGTS. As France is also planning to introduce a carbon price support scheme from 2017, the dynamics of cross-border pricing will change again. Analysis from Carbon Point suggests interconnector imports to the UK will fall by a third as a result, and that German coal-fired production will increase. This makes the role of interconnection in supplying the UK markets uncertain, and raises questions about whether its inclusion in the capacity market will undermine security of supply. When calculating the de-rated capacity of interconnectors, BEIS does take into account relative price movements as well as technical reliability, but accurate long-term price modelling is highly complex and subject to significant uncertainty, so reliance on interconnectors to deliver capacity is not without risk. So what next for the carbon price floor? With the Chancellor’s Autumn Statement fast approaching, lobbying on both sides is ramping up. 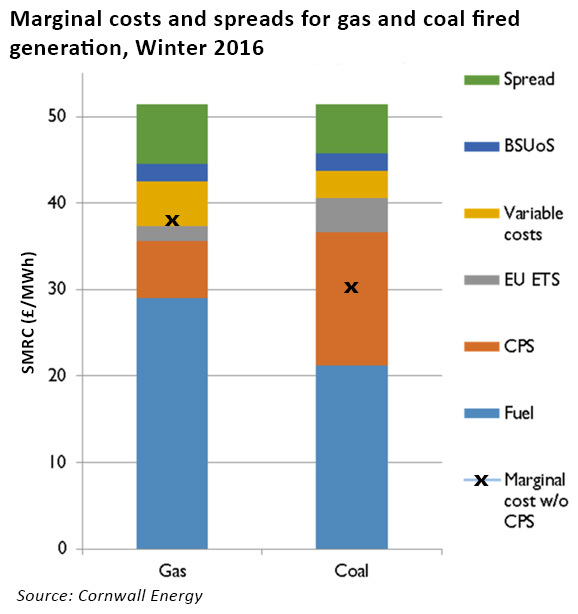 Last week Cornwall Energy published a brief analysis of the impact of removing the carbon price floor, which concludes that removal of the CPF would see coal coming back onto the system at the expense of gas, and would reduce wholesale prices by £12 /MWh equating to £36 per year off domestic bills. On the face of it, this would seem to be a regressive step in the decarbonisation context, but the government has mooted other legislation to encourage the closure of coal plant, so removal of the CPF could see the long-sought new investment in gas plant, as gas margins would increase. 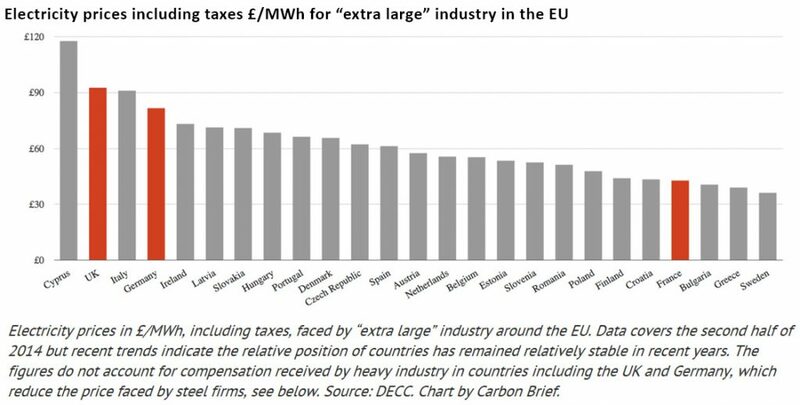 Last year CCGT utilisations were as low as 10% whereas this year they have been closer to 50%, however this recovery masks the fact that margins remain low and insufficient to incentivise construction of new plant. Ultimately, the CPF distorts the electricity markets, and is a circuitous means of achieving the decarbonisation goal. In the absence of viable CCS technology, the near term objective to promote decarbonisation whilst maintaining security of supply should focus on incentivising development of new gas plant. Removal of a significant cost component would go a long way to achieving this, while at the same time reducing the overall cost burden of energy on the economy, which would be a welcome boost in these times of Brexit-related uncertainty.